Akoustic Odyssey are an Australian, original, instrumental, world fusion musical group. Consisting of guitar, bass, cello, violin, percussion, drums, flute, clarinet and soprano saxophone, this combination creates a rich and truly unique sound. The blend of these original works and the newness of the sound make Akoustic Odyssey true innovators. It has been described that “Akoustic Odyssey are uncatergorisable” (Julia Lester ABC Classic FM) and their music is “crucial evidence of the treasure trove of musical genius we are blessed with in South Australia” (David Jobling, Independent Weekly-2007) They are influenced by so many different musical styles including Rock/Metal, Classical, Jazz, Greek, Spanish, Latin, Middle Eastern, African and Celtic that this in turn makes them truly Australian. 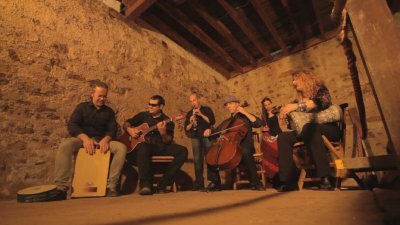 Founded in 2005 by current band members Joshua Tsounis and Anne Harrington, Akoustic Odyssey quickly grew into it’s current format of six members. Their first major performance was at the 2006 Adelaide Fringe Festival. It was here that they won the Bank SA people’s choice award. In the same year they made their first recording, an EP of six tracks. In 2007 , at the same festival they were nominated for the same award. In 2008 the band’s first full length album titled ‘ILIOS’ was released. The recording and marketing was assisted financially by Arts SA and the launch was sponsored by Ceceres Music. Shortly after the CD launch, Akoustic Odyssey were invited to perform at the 2009 WOMADelaide festival. This performance was a great success for the band where they played to a very responsive crowd of over 5000. During the same year the band travelled to Canberra to perform at the National Folk Festival. The band receives regular support and airplay on local and national radio stations such as ABC Classic FM and SBS radio.